What is Cruse Bereavement Care? Thank you for visiting our website for Cruse Bereavement Care – York, Harrogate & North Yorkshire branch. Our Facebook page is regularly updated with helpful articles, news and information. To contact York Cruse please phone 01904 481162 or email: york@cruse.org.uk or you can send us a message through our Facebook page via Messenger. The Cruse National Helpline can offer a listening ear and emotional support to anyone who has lost someone they love, or have been affected by a bereavement. All calls are answered by trained Cruse volunteers who are there to help you talk things through. They can also help you to find your local Cruse branch, or signpost you to other services and useful sources of information. The helpline is open Monday-Friday 9.30-5pm (excluding bank holidays), with extended hours on Tuesday, Wednesday and Thursday evenings, when it is open until 8pm. The freephone number is 0808 808 1677. 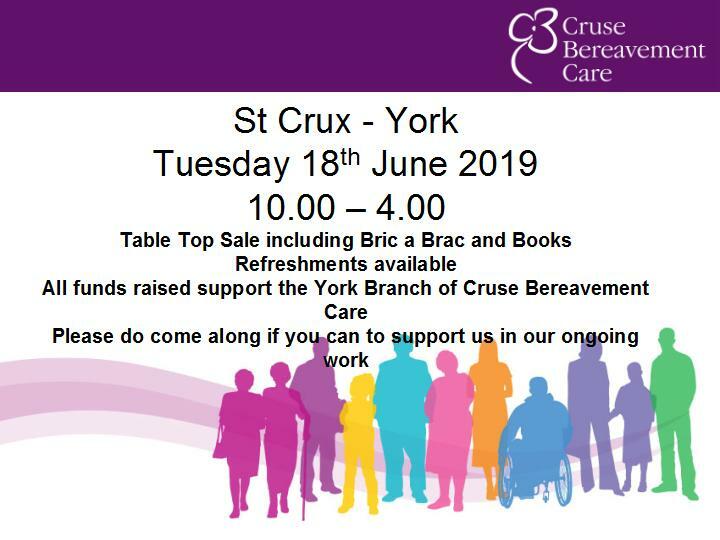 We will be holding our annual fundraising event on Tuesday 18th June, 2019 at St Crux, Pavement, York – please do come along to support us in our ongoing work – we would love to see you there!